Susannah was the righteous wife of Joachim of Babylon, a wealthy man. Joachim permitted the wise elders of the community to use his garden to meet and discuss the legal matters of the land. It was there that Susannah came to the notice of two elders, who hid in the garden until her maids left to fetch her washing things. The elders threatened to accuse Susannah of adultery if she did not sleep with them. Susannah chose not to sin and refused their advances, so the two elders denounced her in a public assembly. The assembly called for her death, for they did not believe that the elders could lie, because of their age and position. Susannah prayed to God, who sent the wise young Daniel to arbitrate on her behalf. By separating the two elders and getting contradictory testimony during cross-examination, Daniel was able to demonstrate that they had lied. The assembly then condemned the elders to death, and Susannah was exonerated. Here Susannah is depicted fully clothed, which is the medieval tradition. In Renaissance depictions, she is usually shown mostly naked. Set in a border of arabesques (part of which is modern). Susannah appears in the centre, head bowed demurely. Two men on the right, from the public assembly, pull the front of her gown. They are going to lead her before the assembly where she will be tried as an adulteress. One of her accusers appears on the left of the panel and standing next to him is Susannah's maid. Their is a townscape in the backgrond. The whole executed in brown/black pigment and silver stain. Located on the bands on the elder's robe. Apparently has no meaning. 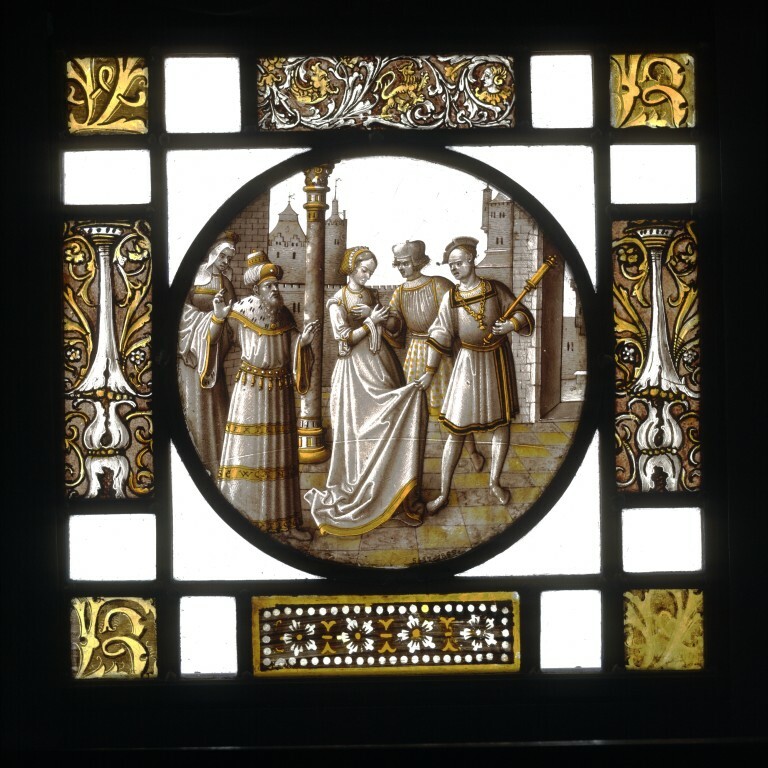 Stained and painted glass roundel depicting Susannah being accused by the Elders and led to judgement. Made in the Netherlands, ca. 1530.